The Dark Knight Rises is pure spectacle of the grandest sense. Writer/director Christopher Nolan has crafted a massive cinematic experience, closing his Batman trilogy with incredible ambition and theatrics. Nolan takes the caped crusader as far as her can go, ending his DC Comics saga. The film is imminently watchable yet hard to process due to the scale and size of its epic scope. It lacks a certain narrative context despite some astonishing drama. 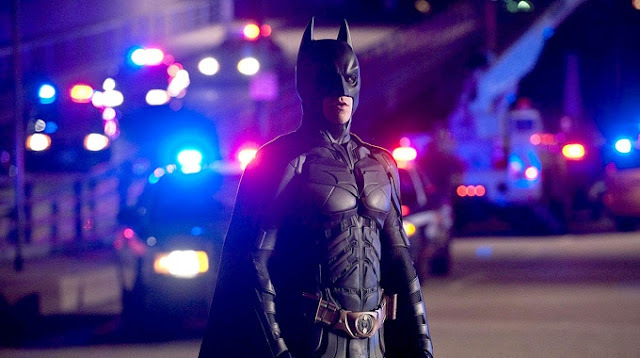 It is difficult to compare The Dark Knight Rises to its predecessors. It shares little with The Dark Knight, besides being set in its aftermath, as Batman takes the blame for Two-Face's violent rampage. However, the sequel ties in heavily to Batman Begins (including flashbacks) despite bearing little resemblance to its construction. If the first was an origin story involving fear and loss and its sequel was an anarchic exploration of humanity, this is a bombastic, deconstructive look at redemption and hope. The ensemble cast is thoroughly talented. Anne Hathaway, the highlight of the film, delivers a charming turn as the cat burglar Selina Kyle (never referred to as "Catwoman"). Her motives are shadowy and mysterious. She shows up to delight and complicate. Hathaway changes her characteristics with a whim as a careful mimic who is always putting on a performance. She weaves in and out of the film's plot slyly. I was surprised by how comic book-like the film was. The disaster like plot line is hugely ambitious, executed with great scale as the villainous Bane takes over Gotham City and holds it hostage. Played by the brutish Tom Hardy (Inception), Bane is a huge physical and psychological opponent. He is vastly different than Heath Ledger's Joker who was a sheer force of will and terrifying due to his insanity. I never understood the fear Bane willed in the face of his glaring weakness, surrounded by nameless gun-wielding thugs yet commanding absolute power. Bane is not a consistently compelling villain despite a more than capable, larger than life performance from Hardy. His name is constantly mentioned as a source of evil. He's established as menacing and terrifying in an amazing aerial opening sequence. However, he's hampered by his mask and artificial voice. He's not slick like Liam Neeson or Cillian Murphy, nor entertaining like Ledger or compelling as Aaron Eckhart. He's just not as interesting and requires slight misdirection to reveal his evil motivations. He is an ideological bully and maniacal warrior. This kind of fury does not sustain and lags over the film's lengthy runtime. Unfortunately, Batman is absent from the screen for large gaps. Christian Bale is at his best with an emotionally driven, physical performance. He really embraces being Bruce Wayne and brings a heft and weight to Batman. Half the film is from the point of view Joseph Gordon-Levitt as Detective John Blake. Not based on any comic character, Blake acts as a real-life sidekick, influenced by Batman's many wards and crime fighting partners. Everything else is beautiful and spectacular. From the hour of IMAX filmed footage, production design, action choreography, and stunning cinematography, The Dark Knight Rises is meticulously crafted technically. Nolan includes all his trademark storytelling techniques with subtle twists, nods, and references. The grand finale is rushed with elements shoehorned in to close out the trilogy in a nice little package. At 165 minutes, The Dark Knight Rises never feels bloated or long with a good pace and momentum. There's just so much going on, so many characters, and a lot of loose ends to clear up. It's thrilling and entertaining but lacks the substance, weight, and vision of its predecessors. The Dark Knight Rises defies most expectations of a film. Unfortunately, it works more as a roller coaster experience and spectacle than a tightly weaved, cinematic story. Fortunately, most of its problems are hidden by its audacious blockbuster filmmaking and dramatic highs. The film begs be seen to be discussed and dissected. It goes beyond any idea of what a man in a mask can do.